Steve became involved with Quail Springs before it was even Quail Springs, coming to the neighboring canyon as a counselor for Wilderness Youth Project with Warren Brush in the early 2000’s. Steve has loved the wilderness and agriculture since his earliest days as a child in rural New Jersey. After studying at the College of Marin, his love of adventure and wild places led him into photojournalism, where he traveled and lived in many places including Japan, Vietnam and Australia. This portion of his life culminated with his living for 7 years on the Greek island of Samos, where he reveled in the beauty of the sea and mountains while working on small scale sustainable farms and fisheries – that even then were disappearing. When his daughter was born in the early 80’s, Steve’s focus shifted to sharing his love of nature with her and her friends. This ultimately led to his involvement in the outdoor education program at Santa Barbara Middle School(SBMS) and Wilderness Youth Project. 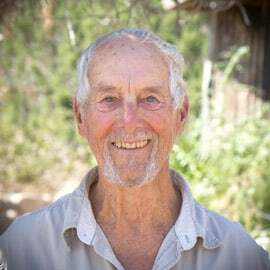 With his retirement he returned to Australia, where he lived in a permaculture village, then to Hawaii where he worked in a community garden and land restoration project. During all these years, he returned to do one trip per year with SBMS, visit his daughter and spend about a month at Quail Springs. He has worked in the gardens, on the buildings, and with the programming. His love of the land at Quail Springs, commitment to restoring the land throughout the Cuyama Valley, and passion for helping people of all ages live in balance with nature has led him to return to Quail Springs full time where he now has a small cabin.